Girl power was at the fore last week, with two female apprentices claiming the main prizes at the In-Comm Training Awards. 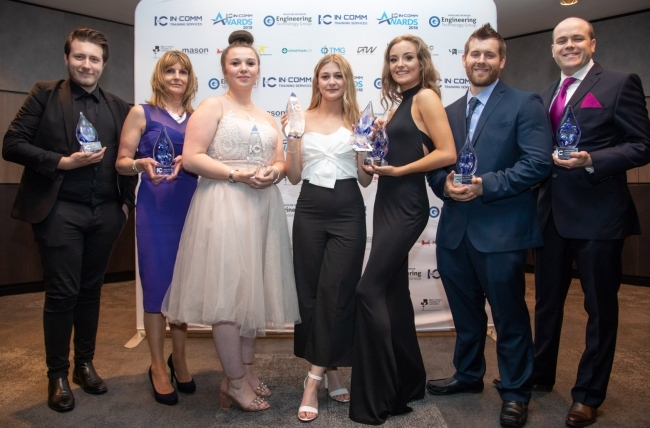 Integrated Water Services’ Laura Thacker was named as the ‘Most Improved Learner of the Year’ having overcome several setbacks to develop her skills and excel in her apprenticeship, whilst Maria Collins from IMI Precision (Norgren) secured the ‘Outstanding Learner of the Year and Peter Wood Memorial’ title. The latter impressed an industry-led judging panel with her level of dedication to work and the way she has employed excellent management and organisational skills to take control and successfully complete projects. They were joined on stage by Caterpillar Shrewsbury’s Lauren Ball, who is one of the first apprentices in the country to be trained at the Marches Centre of Manufacturing & Technology in Bridgnorth. Despite being the only female in her first cohort, the ‘Learner of the Year In-Comm Academies Engineering’ has shown a real appetite for new challenges and often leads from the front, carrying out every job to the best of her ability. The focus was also on companies, with Birmingham-based precision metal stamping specialist Brandauer taking the ‘Employer of the Year’ title for the way it has made apprentices more than 15% of its total workforce, helping it to retain specialist skills and reduce the average age of staff to just 44 in the process.